DC Comics (Detective Comics Comics) has just introduced a new 'spin' logo, created by Josh Beatman of Brainchild Studios. The original DC 'bullet' logo surrounded by the four stars was created by Milton Glaser, who also created the I <3 NY logo. 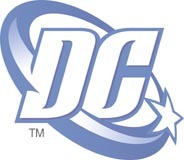 The way the DC logo was rebranded follows the same lines the UPS logo recently went through, from a stock monochromatic logo to a modern gradient logo. But though I no doubt love the new UPS logo (and hate the company), I'm unsure as to how I feel about this new DC logo. Nothing about it really stands out and makes it unique. Sort of loses its voice now. Read more at Newsarama 1, 2, and at DC Comics. I guess all my underwear are outdated now, all good, they needed replacing anyway. Time to make a trip to Macy's and get myself a new set of DC underwear. In other logo news, I never realized the arrow underneath the Amazon logo was an arrow pointing from A to Z. I always thought it was some weird smile. I thought it was a smile, too. But also an arrow because they deliver. Totally missed the A-Z thing. It's not like the awesome arrow in the FedEx logo between the E and the X.